A modern dwelling that celebrates the desert, mountains, and light. Located in Paradise Valley, Arizona, the poetically named Dancing Light house celebrates nature through creative contemporary design. 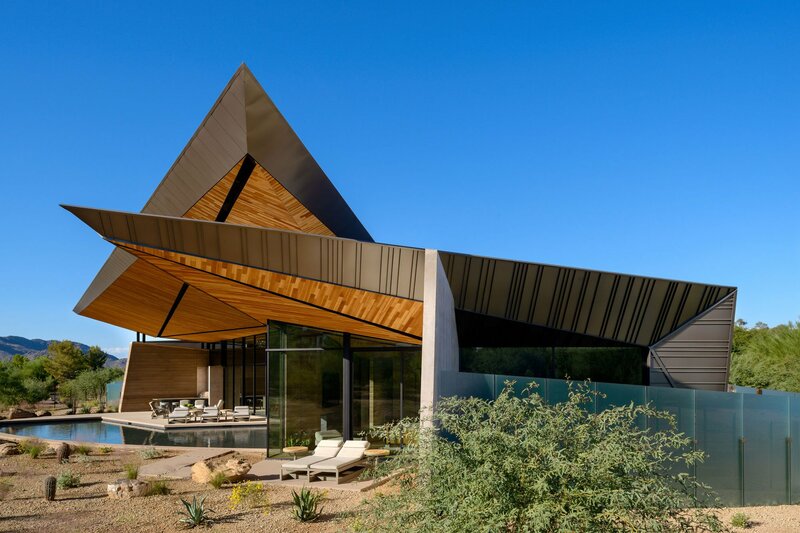 Architect Brent Kendle of Kendle Design Collaborative designed the dwelling and its guest house with striking geometric shapes that mirror the surrounding mountains, with other details also paying homage to the desert landscape. Nature provides the main foundation for the house’s aesthetic and for its distinct character. 180 degree views of Camelback Mountain connect the interior to the stunning location. The eye-catching element of the entire structure, a floating roof canopy gives a sculptural accent to the design. At the same time, it creates a perfect balance between the cozy living spaces with a lower ceiling and the sweeping views created by the large windows and elevated roof. Tectonic-like shapes reference both the local geology and monsoon cloud formations. To keep the focus on the form and natural materials, the architect designed concealed lighting and mechanical systems that remain hidden from sight. Layered rammed-earth walls link the modern interior to the desert, while concrete, metal, and glass provide a counterbalance to the organic forms. These different materials also visually articulate various areas and functions inside the house. Apart from the topography and features of the land, the house also draws inspiration from natural light. Flooding through windows or seeping through narrow openings, Arizona’s sunshine changes the living spaces throughout the day. Reflected off the swimming pool surface, the light creates bright and dynamic compositions on the fractured wall planes. At other times, its soft glow enhances the interior’s sense of calm. Arranged around a central courtyard-like space, the rooms allow natural light and the mountain breeze to flow through the house. Photographs© Kendle Design Collaborative.